In concert you’ll hear The Cadleys perform everything from traditional mountain ballads and bluegrass classics like “Bury Me Beneath the Willow” and Bill Monroe’s “Blue and Lonesome,” to Alison Krauss’ “The Lucky One,” to the Louvin Brother’s “Cash on the Barrelhead,” to Cathy’s knockout version of “Over the Rainbow.” You’ll also hear some innovative acoustic arrangements of favorite Beatles tunes like “I Will,”plus a generous sampling of John’s original songs, many of which have been recorded by national bluegrass artists like Jim Hurst, Missy Raines, Tony Trischka, Amy Gallatin, and Lou Reid, who took John’s song “Time” to the #1 spot on the national bluegrass charts. Rounding out the band is first-call veteran bassist John Dancks, a member of the Syracuse Area Music Hall of Fame, and Perry Cleaveland, one of the most in-demand mandolin players in Upstate New York. Perry’s virtuoso playing has been featured in just about every prominent acoustic act in the area, recorded and live, bluegrass and otherwise. 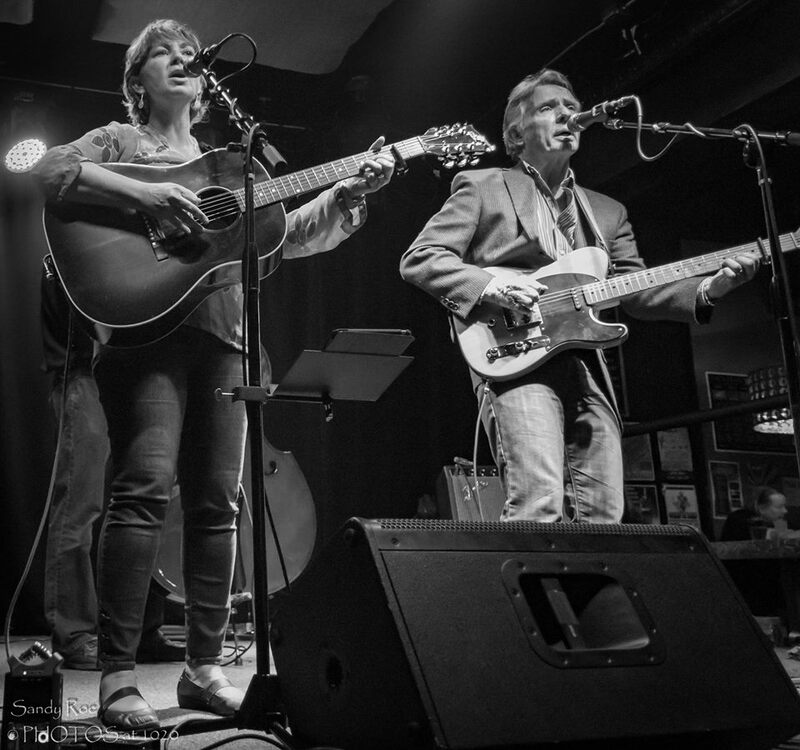 In short, a live show by The Cadleys does everything audiences come to a concert for: great singing, solid musicianship, entertaining rapport, and the feeling that they’ve enjoyed a truly special night of music. John began playing guitar at the age of 13 after hearing a recording of the Kingston Trio—and he’s been performing ever since. Beginning in folk music, he moved on to bluegrass and then country music, playing with such seminal Northeast bands as the Down City Ramblers, Cross Creek, Texas Hots, and The Lost Boys. John has been a touring road musician out of Nashville, and his songs have been recorded by national bluegrass artists such as Tony Trischka, Jim Hurst, Missy Raines, Amy Gallatin, Richard Kiser, the International Guitar Duo, and Lou Reid, who took John’s song, “Time,” to the #1 spot on the national bluegrass charts for three consecutive months. John was recently inducted into the Syracuse Area Music Hall of Fame. John (JD) Dancks has been a fixture on the Central New York acoustic music scene since his days at Syracuse University, when he played with banjo great Tony Trischka in the Down City Ramblers. He has also played with renowned guitarist Russ Barenberg and in the national touring act Country Granola with singer Danny Weiss. JD is first-call bassist for anyone playing blues, country, rock, jazz, and folk. So much so, that he has been inducted into the Syracuse Area Music Awards “Hall of Fame.” He’s added his solid, tasteful playing to many studio sessions as well, recording both locally and for national labels such as Rounder Records. Cathy discovered a passion for the guitar at age 11 when she began taking lessons from her uncle, international touring singer/songwriter Ed Hamell. Since then she’s studied a variety of genres, including classical, jazz, flatpicking bluegrass, and clawhammer banjo. One of the highlights of a Cadleys concert is seeing the audience response when Cathy breaks from her mesmerizing singing, developed over 20 years as the director of a church vocal and instrumental ensemble, to deliver a fast, soulful acoustic guitar solo. It’s a rarity to have both those talents, plus a third—i.e., her ability to connect instantly with an audience. Taken together, they make Cathy Cadley a powerful live performer. Perry is a SAMMY Award winning mandolinist who also adds harmony vocals and fiddle. Born in Louisville, Kentucky Perry emigrated to Syracuse, N.Y. and grew up in a household that hosted many bluegrass luminaries during his formative years. In his High School years, and continuing later, he began playing in a number of New York State Bluegrass bands including: Hard Times, Pleasant Valley, Bristol Mountain Bluegrass, Rosewood, John Rossbach & Chestnut Grove, The McCarthy Paisley Band, and Lost Time. He has performed for festivals, colleges, clubs, private parties, corporate events, arts centers, schools, town concerts, PBS/NPR affiliates: WCNY, & WXXI, and New York State Council on the Arts-sponsored events, including Arts in Education series’ under the auspices of Young Audiences of Rochester.